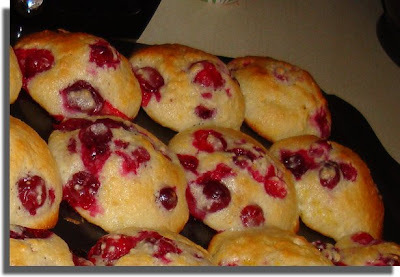 This weekend I thought I'd experiment with a regular muffin recipe and create some Mega-Cranberry-Orange Mini Muffins®*. Packing in as many cranberries as possible (hence the "Mega" in the Mega-Cranberry-Orange Mini Muffins monniker), adding orange zest and juice... mmmm. I must admit they were delish. I was feeling very "Martha". Later that same day I had a craving for some Buttery Redenbacher's Gourmet Popping Corn. Remove bag from cellophane cover. Check. Place in microwave the Proper Side Up. Check. 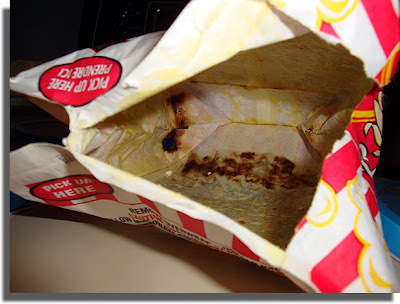 Remove burnt popcorn from microwave. I swiftly returned from my "Martha" state back to being plain old "Maureen" again. The muffins look very extra-scrumptious. I like popcorns, but not the burnt-up kind. We have a "popcorn" button on our microwave. I have no idea how long it goes for, but it makes perfect popcorn every time! Jeff: Sure. Rub it in. But it takes REAL talent to screw up simple one-button cooking you know! oooh, looking at those muffins is making me hungry!!! now if only you had already marketed your product, i might be able to get ahold of some Mega-Cranberry-Orange Mini Muffins® in my neck of the woods. Maureen, it would take me 2 meals to eat one of those muffins, but they look great. I don't have a popcorn button on my microwave, but then this isn't Northern America. It's far, far better to be able to cook your own 'improved recipe' muffins from scratch, than be able to pop ready-prepared popcorn in a microwave, Maureen. The muffins look very scrumptious, but the burned popcorn is more, well, more Maureen. Only joking hahaha! Yeah, I succeeded in making some burnt popcorn the other day. That smell...it lingers. It really does. Those muffins look good enough to eat! Ashley: Ha! Well, I'd better get those Mega-Cranberry-Orange Mini Muffins® out there! Maybe daughter can get Starbucks to start selling them! I'd make a for-tune! VE: OMG, now you have to admit YOU WATCH MARTHA! That was perfect!!! Aw, Jay, you are a sweetie. Thank you for the ego boost! Beetle: No, you are absolutely right, Babs! Shawn: How right you are... there is nothing worse than the smell of burnt popcorn; especially when it's your last bag. I'll make you popcorn if you let me have some of those muffins! Toners: Yes, I did bask in the moment... fleeting as it was. Fun while it lasted! lol The muffins look fabulous! I'm a sucker for cranberry orange. Janet: Yes, we are sisters, remember? So we both have to like them... like the Starbucks Cranberry Bliss bars.... mmmmm. Maybe you should send this post to Martha, and ask her advice. The caption reads: How to Make Gourmet-Style Prison Popcorn? I am very impressed. As someone who burns water I can only imagine how to make such scrumptious muffins. However, thanks to my trusty all-knowing microwave I can make popcorn without burning it. It is much smarter than me.